During the course of acute infection with an intracellular pathogen, Ag-specific T cells proliferate in the expansion phase, and then most of the T cells die by apoptosis in the following contraction phase, but the few that survive become memory cells and persist for a long period of time. Although IL-15 is known to play an important role in long-term maintenance of memory CD8+ T cells, the potential roles of IL-15 in CD8+ T cell contraction are not known. Using an adoptive transfer system of OT-I cells expressing OVA257–264/Kb-specific TCR into control, IL-15 knockout (KO) and IL-15 transgenic (Tg) mice followed by challenge with recombinant Listeria monocytogenes expressing OVA, we found that the survival of CD44+CD62L−CD127− effector OT-I cells during the contraction phase is critically dependent on IL-15. In correlation with the expression level of Bcl-2 in OT-I cells, the number of OT-I cells was markedly reduced in IL-15 KO mice but remained at a high level in IL-15 Tg mice during the contraction phase, compared with control mice. In vivo administration of rIL-15 during the contraction phase in IL-15 KO mice inhibited the contraction of effector OT-I cells accompanied by up-regulation of Bcl-2 expression. Furthermore, enforced expression of Bcl-2 protected the majority of effector OT-I cells from death in IL-15 KO mice after infection. These results suggest that IL-15 plays a critical role in protecting effector CD8+ T cells from apoptosis during the contraction phase following a microbial infection via inducing antiapoptotic molecules. Upon encounter with a pathogenic microbe, naive Ag-specific CD8+ T cells proliferate and differentiate into effector CD8+ T cells during the expansion phase. Most of the activated T cells die by apoptosis during the contraction phase, but the few that survive become memory cells and persist for a long period of time (1, 2, 3). The size of memory CD8+ T cell pool is dependent on the amounts of surviving T cells from T cell contraction by apoptosis after primary TCR-mediated activation. Therefore, identification of molecular mechanisms responsible for activated T cell death during the contraction phase is important for our understanding how memory develops after infection with microbes. At least two types of cell death can occur in activated T cells during the contraction phase: activation-induced cell death (3), also called Ag-driven apoptosis, and activated T cell autonomous cell death (ACAD)3, also called growth factor withdrawal-induced apoptosis (4, 5, 6). Activation-induced cell death is triggered mostly through cell surface proteins of the TNFR family, including Fas (CD95) (7, 8, 9). However, recent studies using Fas/Fas ligand mutant or Fas/TNFRI-deficient mice have demonstrated that neither Fas/Fas ligand nor TNFRI is required for T cell death during the contraction phase (10, 11, 12, 13, 14). In contrast, evidence that ACAD is responsible for the death of the majority of activated T cells responding to a foreign Ag has been obtained (10, 11, 14). Several studies have shown that the death of the majority of activated T cells responding to a foreign Ag in vivo can be prevented by enforced expression of Bcl-2, indicating that Bcl-2 up-regulation in effector T cells plays a critical role in preventing activated T cell death by ACAD during the contraction phase (10, 11, 14). Several studies have demonstrated that Bcl-2 expression was induced via signaling from the common cytokine receptor γ (cγ)-chain (15, 16). Gett et al. (17) have reported recently that naive CD8+ T cells receiving prolonged or strong stimulation of TCR can differentiate into effector cells and survive as memory T cells by enhancing IL-15/IL-7 responsiveness. Thus, IL-15 and IL-7 may play a critical role in up-regulation of Bcl-2 and the survival of effector CD8+ T cells during the contraction phase. IL-15 belongs to the four-helix bundle cytokine family and uses IL-2/-15Rβ- and cγ-chains for signal transduction (18, 19, 20) and has the potential roles in maintenance of Ag-specific memory CD8+ T cells during the memory phase via inducing slowly dividing and/or via inducing antiapoptotic molecules such as Bcl-2 without Ag stimulation (21, 22, 23). In contrast, potential roles of IL-15 during the expansion and contraction phases after acute infection remained to be controversial. 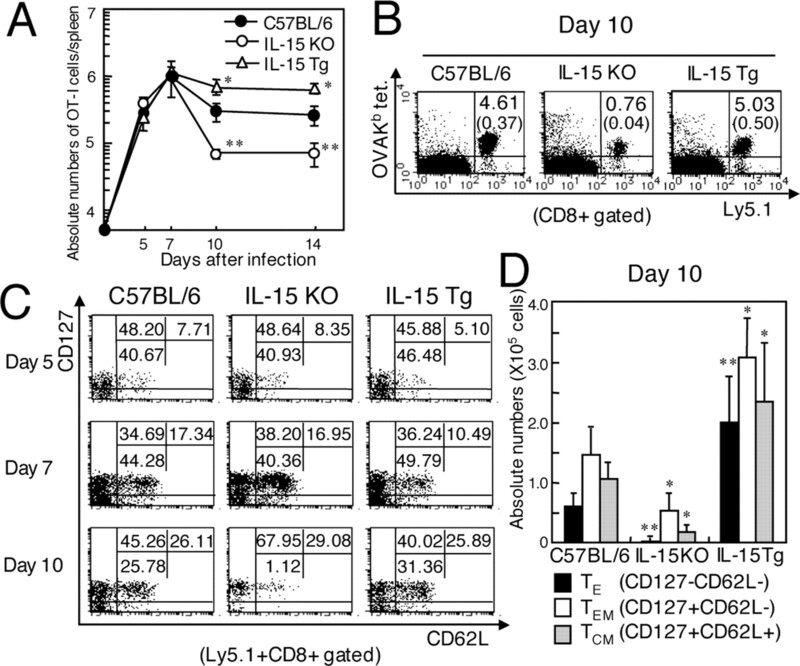 There are several lines of evidence that IL-15 is not mandatory for expansion of effector CD8+ T cells during the expansion phase following acute infection with lymphocytic choriomeningitis virus (LCMV) or Listeria monocytogenes (21, 22, 23), while IL-15 were reported to play a critical role in CD8+ T cell response to one epitope of LCMV (21) or vesicular stomatitis virus (VSV) during the expansion phase after infection (24). In the present study, we examined the roles of IL-15 in activated T cell death using a system of adoptive transfer of OT-I cells expressing OVA257–264/Kb-specific TCR into naive IL-15 knockout (KO) and IL-15 transgenic (Tg) hosts that were subsequently infected with recombinant Listeria monocytogenes expressing OVA (rLM-OVA). Our results demonstrate that the survival of effector CD8+ T cells during the contraction phase is critically dependent on IL-15. These findings provide an insight into approach to develop effective vaccination for generation of long-lived CD8+ T cell memory. C57BL/6-background IL-15 Tg mice, which were constructed using originally described IL-15 cDNA, have been described previously (25). C57BL/6-background IL-15 KO mice were purchased from Taconic Farms. IL-15Rα KO mice were purchased from The Jackson Laboratory and were >10 generations backcrossed to C57BL/6 mice. OT-I mice expressing the OVA257–264/Kb-specific TCR and C57BL/6 Ly5.1-congenic mice were also obtained from The Jackson Laboratory. Eμ-bcl-2-25 Tg mice, which express Bcl-2 under the control of the 5′ IgH enhancer (Eμ) in T cells, were described previously (26). Bcl-2 Tg OT-I mice were generated by crossing OT-I (Ly5.1+) mice with the Eμ-bcl-2-25 line. IL-15Rα KO OT-I mice were generated by intercrossing OT-I mice with the IL-15Rα KO mice. rLM-OVA were described previously (27). Bacterial virulence was maintained by serial passages in C57BL/6 mice as described previously (28). Mice were infected i.p. with a sublethal dose of 5 × 105 CFU (∼0.1 LD50) or a lethal dose of 5 × 107 CFU (∼10 LD50) of rLM-OVA in 0.2 ml of PBS on day 0. The spleen and liver were removed from each mouse and separately placed in homogenizers containing 3 ml of HBSS. These samples were spread on trypto-soya agar plates, and colonies were counted after incubation for 24 h at 37°C. FITC-conjugated anti-CD44 (IM7), Ly5.1 (A20), CD62L (MEL-14), and IFN-γ (XMG1.2) mAbs; PE-conjugated anti-Vα2 (B20.1) and CD127 (A7R34) mAbs; CyChrome-conjugated anti-CD8α (53-6.7) mAb and streptavidin; allophycocyanin-conjugated streptavidin; and biotin-conjugated anti-Ly5.1 (A20) and Ly5.2 (104) mAbs were purchased from eBioscience. FITC-conjugated hamster anti-mouse Bcl-2 mAb (3F11) and its isotype FITC-conjugated control Ab to hamster were also obtained from BD Biosciences. FITC-conjugated anti-active caspase-3 mAb were also obtained from BD Biosciences. CFSE was purchased from Molecular Probes. OVA257–264 H-2Kb tetramers were purchased from MBL. Splenocytes were preincubated with a culture supernatant from 2.4 G2 to prevent nonspecific staining. After washing, cells were stained with various combinations of mAbs. Staining with biotin-conjugated mAb was followed by treatment with streptavidin-CyChrome or -allophycocyanin. In some experiments, splenocytes were subjected to intracellular staining using a Fast Immune Cytokine System according to the instructions of the manufacturer (BD Biosciences), and the fluorescence of the cells was analyzed using a flow cytometer. OT-I chimeras were generated by adoptive transfer of 1–2 × 106 naive OT-I cells into naive mice followed by rLM-OVA infection. Transferred OT-I cells were identified by staining with an mAb to Ly5.1, CD8, and Vα2 or OVA257–264 Kb tetramer. 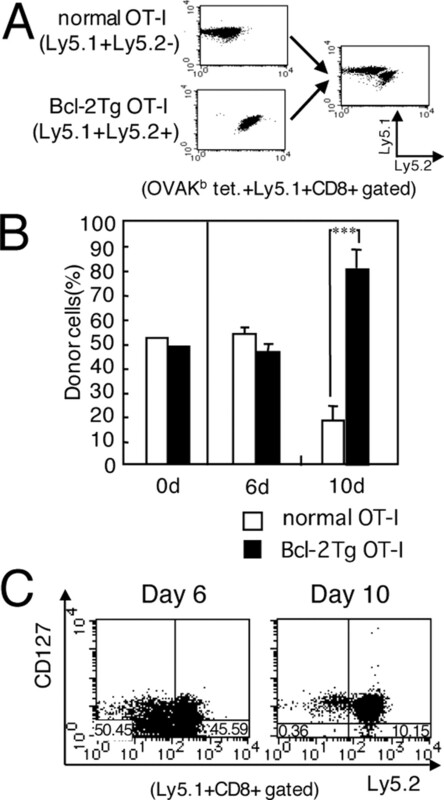 In some experiments, a mixture containing an equal number of OT-I cells (Ly5.1+Ly5.2−) and Bcl-2 Tg OT-I cells (Ly5.1+Ly5.2+) from the spleen was injected i.v. into IL-15 KO hosts (Ly5.1−Ly5.2+) that were subsequently infected with rLM-OVA 24 h later. The mixtures were analyzed to determine the actual ratio of each subset of donor cells by staining with Ly5.1, Ly5.2, Vα2, and CD8 mAbs. Effector OT-I cells were labeled with CFSE as described previously (28). Proliferation of transferred OT-I cells was visualized by flow cytometry analysis of their CFSE profile. The significance of all data was determined by Student’s t test. A value of p < 0.05 was taken as the level of significance. Analysis was conducted using Stat-View 5.0 software (Abacus Concepts). To determine the potential roles of IL-15 in CD8+ T cell contraction, we examined the fate of OT-I cells that were transferred into IL-15 Tg mice, IL-15 KO mice, or control mice followed by challenge with rLM-OVA. We found that the bacterial number increased to a maximal level on day 3 in the spleen and thereafter cleared completely by day 7 after infection in all groups. There were no differences in the bacterial numbers in the spleen between control (1.6 × 102 ± 1.3 CFU, n = 6) and IL-15 KO mice (1.8 × 102 ± 1.7 CFU, n = 6) or IL-15Rα KO mice (1.3 × 102 ± 1.5 CFU, n = 5) on day 6 after infection, whereas the number was significantly lower at the peak level in IL-15 Tg mice (8.2 × 105 ± 2.3 CFU in control mice and 0.9 × 105 ± 0.6 CFU in IL-15 Tg mice, n = 6). Consistent with our previous findings (28), the absolute numbers of OT-I cells in the spleen of IL-15 KO and IL-15 Tg mice were almost the same as those in control mice on days 5 and 7 after primary infection (Fig. 1⇓A). In contrast, the number of OT-I cells was markedly reduced in IL-15 KO mice but remained at a high level in IL-15 Tg mice on days 10 and 14 after infection (Fig. 1⇓, A and B). The absolute numbers of OT-I cells in the peritoneal exudate cells (PEC) and peripheral lymph nodes (LN) were also decreased in IL-15 KO mice but remained stable in IL-15 Tg mice during the contraction phase (data not shown). These results suggest that IL-15 plays an important role in maintaining numbers of Ag-specific CD8+ T cells during the contraction phase of immune response. IL-15 is essential for the survival of effector CD8+ T cells during the contraction phase after rLM-OVA infection. Purified naive OT-I cells (Ly5.1+) were adoptively transferred i.v. into naive IL-15 KO mice, IL-15 Tg mice, or control C57BL/6 mice (Ly5.2+) that were infected with rLM-OVA 24 h later. A, On days 5, 7, 10, and 14 after infection, total number of OT-I cells was calculated by multiplying the total number of spleen cells by the percentage of Vα2+Ly5.1+CD8+ cells in the spleen. Data are presented as means ± SDs for five mice. ∗, p < 0.05; ∗∗, p < 0.01. B, Proportions of OT-I cells in the spleens in recipient mice on day 10 after infection are shown. The numbers represent the number of OT-I cells as a percentage of CD8+ T cells and as a percentage of total lymphocytes (parentheses). C, On days 5, 7, and 10 after rLM-OVA infection, double staining of activated OT-I cells for surface expression of CD62L and CD127 was performed. The results of flow cytometry are presented as typical profiles after an analysis gate had been set on Ly5.1+CD8+ cells. D, Absolute number of effector cells (TE), effector memory cells (TEM), or central memory cells (TCM) of OT-I cells from IL-15 KO mice, IL-15 Tg mice, and C57BL/6 mice on day 10 after infection was calculated. Data were obtained from three separate experiments, and each value shown is the mean ± SD for three experiments. ∗, p < 0.05; ∗∗, p < 0.01. Recent studies have demonstrated that the surface expression of IL-7R α-chain as a memory T cell marker enables effector T cells to be distinguished from memory T cells at peak time points of primary immune responses (29). Furthermore, Huster et al. (30) reported that a combination of surface staining for CD127 (IL-7Rα) and CD62L enables separation of two functionally distinct memory cell subsets, which are similar to cell subsets recently described as central memory cell subsets (CD127high and CD62Lhigh) and effector memory cell subsets (CD127high and CD62Llow). To determine the requirement of IL-15 for the survival of effector cells or memory cell subsets during the contraction phase, we examined the kinetics of IL-7Rα and CD62L expression on OT-I cells transferred into IL-15 KO mice, IL-15 Tg mice, or control mice after rLM-OVA infection. As shown in Fig. 1⇑C, proportions of IL-7Rαlow OT-I cells in IL-15 Tg mice and IL-15 KO mice were comparable to those in control mice on day 5 after infection, indicating that IL-15 did not affect the generation of effector CD8+ T cells during the expansion phase of primary response. On day 10 after infection, the number of IL-7Rαlow OT-I cells was significantly greater in IL-15 Tg mice (Fig. 1⇑, C and D). In contrast, IL-7Rαlow OT-I cells had almost completely vanished in IL-15 KO mice on day 10 after infection, indicating that IL-15 is crucial in preventing effector CD8+ T cells from apoptosis during the contraction phase. The numbers of IL-7RαhighCD62Llow and IL-7RαhighCD62Lhigh memory OT-I cells were also decreased in IL-15 KO mice but significantly increased in IL-15 Tg mice on day 10 after Listeria infection (Fig. 1⇑D). Thus, these results suggest that IL-15 plays an important role in maintaining numbers of not only effector cells but also memory cell subsets during the contraction phase after Listeria infection. The number of Ag-specific CD8+ T cells is regulated by a balance among cell survival, apoptosis, and proliferation. To determine whether endogenous IL-15 induces proliferation of OT-I cells during the contraction phase, we transferred CFSE-labeled OT-I cells (Ly5.1+) from rLM-OVA-infected normal mice (6 days after infection) into infected IL-15 KO mice, IL-15 Tg mice, or control mice (6 days after infection) and then analyzed the proliferation of OT-I cells on day 4 after transfer. Although the number of effector OT-I cells recovered from the spleen was smaller in IL-15 KO hosts but larger in IL-15 Tg hosts than in control hosts, the effector OT-I cells proliferated equally in all groups by day 4 after adoptive transfer (Fig. 2⇓A and data not shown). Similarly, when the proliferation of OT-I cells was measured by inoculation of BrdU 4 days during the contraction phase after Listeria infection, no differences were observed in all groups by day 12 after infection (data not shown). These results indicate that endogenous IL-15 is dispensable in the proliferation of effector T cells during the contraction phase. IL-15 plays a critical role in the survival but not in the proliferation of activated T cells during the contraction phase after rLM-OVA infection. A, CFSE-labeled effector OT-I cells from C57BL/6 mice on day 6 after infection were adoptively transferred into IL-15 KO mice, IL-15 Tg mice, or C57BL/6 mice that had been infected with rLM-OVA 6 days previously. Recipients receiving effector OT-I cells were analyzed 4 days later. Data are shown as the percentage of OT-I cells (Vα2+Ly5.1+CD8+) that have undergone one or more proliferations and are representative of three independent experiments, each containing three to four mice per group. B, Apoptosis of ex vivo-cultured (24 h) OT-I cells from IL-15 KO mice, IL-15 Tg mice, and C57BL/6 mice on days 5, 7, and 12 after infection was determined by intracellular active caspase-3 staining. An analysis gate was set on Vα2+Ly5.1+CD8+ cells. Data are presented as means ± SDs for three mice at indicated days after infection. C, Changes in mean fluorescence intensity (MFI) of Bcl-2 staining in OT-I cells from IL-15 KO mice, IL-15 Tg mice, and control mice as indicated after rLM-OVA infection are shown. Data are presented as means ± SDs for five mice at indicated days after infection. ∗, p < 0.05; ∗∗, p < 0.01. D, Representative flow cytometric histograms showing the intracellular expression of Bcl-2 in OT-I cells from IL-15 KO mice, IL-15 Tg mice, and control mice on day 7 after infection. 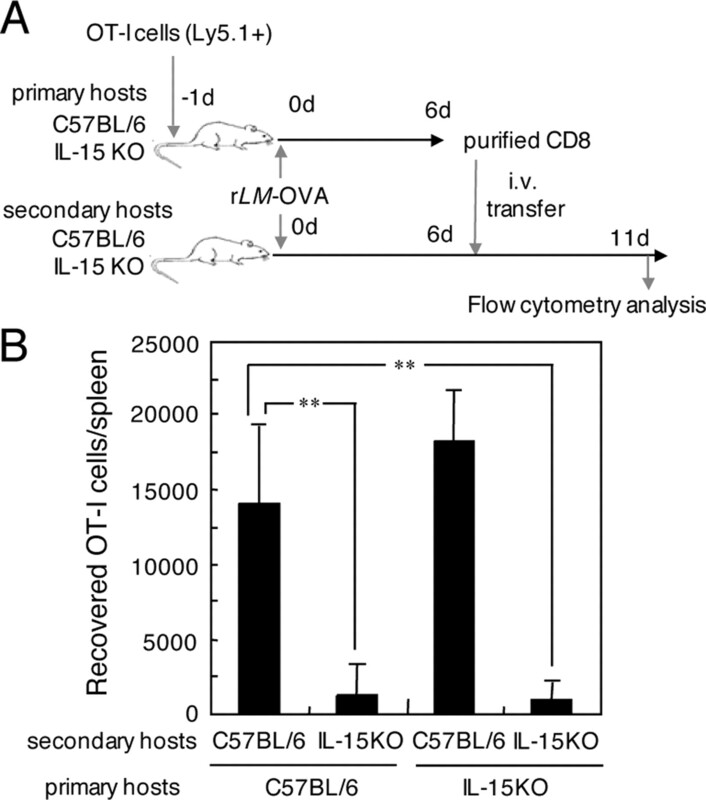 Histograms are gated on Ly5.1+CD8+ cells in spleens from infected mice. The values in the right corner of each panel represent the MFI of Bcl-2 expression in OT-I cells (vertical line, negative control). E, Changes in MFI of Bcl-2 staining in CD127− and CD127+ OT-I cells from IL-15 KO mice, IL-15 Tg mice, and control mice on days 7 and 10 after rLM-OVA infection. ∗, p < 0.05; ∗∗, p < 0.01. To determine whether IL-15 is involved in the survival of effector CD8+ T cells, we next examined the apoptotic potential of OT-I cells from IL-15 KO, IL-15 Tg, and control mice on days 5, 7 and 12 after rLM-OVA infection. On day 7 after infection, the expression level of active caspase-3 in OT-I cells was significantly higher in IL-15 KO mice but lower in IL-15 Tg mice than in control mice after 24 h after of culture (Fig. 2⇑B), indicating that IL-15 may protect the effector CD8+ T cells from apoptosis. We examined the intracellular expression levels of Bcl-2 in OT-I cells from these mice during the expansion phase and contraction phase. As shown in Fig. 2⇑C, the levels of the antiapoptotic protein Bcl-2 in effector OT-I cells from control mice were rapidly down-regulated, compared with those in naive OT-I cells on day 5 after Listeria infection, and Bcl-2 expression was up-regulated gradually during the contraction phase from day 5 to 10 after infection. In correlation with the survival of effector OT-I cells, Bcl-2 expression level in OT-I cells was significantly lower in IL-15 KO mice but higher in IL-15 Tg mice than in control mice during the contraction phase (Fig. 2⇑, C and D). There was no significant difference between the levels of BcL-xL expression in OT-I cells from IL-15 Tg and IL-15 KO mice on day 7 after infection (data not shown). Taken together, these results suggest that IL-15 plays a critical role in the survival but not in the proliferation of activated T cells during the contraction phase of immune response to L. monocytogenes. We next examined intracellular expression of Bcl-2 in IL-7Rαlow and IL-7Rαhigh OT-I cells on days 7 and 10 after Listeria infection. Bcl-2 expression levels in IL-7Rαlow effector OT-I cells of control mice and IL-15 Tg mice gradually increased from day 7 to 10 after infection, and the magnitude of increase was greater in IL-15 Tg mice (Fig. 2⇑E). In contrast, Bcl-2 expression in IL-7Rαlow effector OT-I cells of IL-15 KO mice was not up-regulated from day 7 to 10, indicating that IL-15 plays a critical role in the up-regulation of Bcl-2 expression in effector CD8+ T cells during the contraction phase. In contrast, in IL-7Rαhigh memory OT-I cells from control mice, Bcl-2 expression was up-regulated, compared with that in IL-7Rαlow effector OT-I cells from day 7 to 10 after infection. In correlation with the survival of memory OT-I cells, Bcl-2 expression levels in IL-7Rαhigh memory OT-I cells were significantly lower in IL-15 KO mice but higher in IL-15 Tg mice than in control mice on days 7 and 10 after infection. These results suggest that IL-15 plays a critical role in the survival of not only effector cells but also memory cell subsets during the contraction phase after Listeria infection. To determine whether CD8+ T cell contraction is dependent on the presence of endogenous IL-15 during the expansion phase or contraction phase, we primed OT-I cells in C57BL/6 and IL-15 KO primary hosts with rLM-OVA and, on day 6 after infection, adoptively transferred equal numbers of purified CD8+ cells containing effector OT-I cells into C57BL/6 and IL-15 KO secondary hosts that had been infected with rLM-OVA 6 days previously and examined OT-I cells recovered from the spleen on day 11 after infection (Fig. 3⇓A). As expected, when effector OT-I cells generated in C57BL/6 primary hosts were transferred into infected C57BL/6 secondary hosts, OT-I cells were recovered from the spleen on day 11 after infection (Fig. 3⇓B). In contrast, when effector OT-I cells generated in IL-15 KO primary hosts were transferred into infected IL-15 KO secondary hosts, OT-I cells were hardly detected in the spleen on day 11 after infection. This is consistent with data obtained from kinetics analysis of OT-I cells shown in Fig. 1⇑A. In contrast, when effector OT-I cells generated in IL-15 KO and C57BL/6 primary hosts were transferred into C57BL/6 secondary hosts, the numbers of OT-I cells were similar. In contrast, the numbers of effector OT-I cells from C57BL/6 primary hosts were reduced in IL-15 KO secondary hosts to ∼10% of those in C57BL/6 secondary hosts by day 5 after transfer, indicating that the presence of endogenous IL-15 during the contraction phase is essential for the survival of effector OT-I cells after Listeria infection. This was not caused by migration of effector OT-I cells to the spleen from other anatomical locations, as we observed a similar defect in OT-I cells isolated from PEC and peripheral LN (data not shown). Endogenous IL-15 is required during the contraction phase but not the expansion phase for the survival of effector CD8+ T cells after rLM-OVA infection. A, Effector OT-I cells from IL-15 KO primary hosts or C57BL/6 primary hosts on day 6 after infection were adoptively transferred into IL-15 KO secondary hosts or C57BL/6 secondary hosts that had been infected with rLM-OVA 6 days previously. Secondary recipients receiving effector OT-I cells were analyzed 5 days later by flow cytometry. B, Absolute number of transferred OT-I cells in the whole splenocyte population was calculated. Data were obtained from three separate experiments, and each value shown is the mean + SD for three mice. ∗∗, p < 0.01. To further confirm the requirement of IL-15 for the survival of effector CD8+ T cells during the contraction phase, we examined the effect of in vivo administration of exogenous IL-15 during either the expansion or contraction phase on the survival of effector OT-I cells transferred into IL-15 KO hosts on day 11 after rLM-OVA infection. As shown in Fig. 4⇓A, the administration of rIL-15 during the initial expansion phase (1–4 days) had no effect on contraction of the OT-I cells in IL-15 KO hosts on day 11 after infection. In contrast, rIL-15 administration during the initial contraction phase (7–10 days) prolonged the expansion of OT-I cells in IL-15 KO hosts and resulted in an increased number of OT-I cells after infection. This effect was seen in cells isolated from a variety of lymphoid and nonlymphoid compartments, including PBMC, peripheral LN, and PEC (data not shown). Although OT-I cells expressing low levels of CD127 were not detected in IL-15 KO mice treated with PBS during the contraction phase on day 11 after infection, these cells survived in IL-15 KO mice treated with rIL-15 during the contraction phase at the same time (Fig. 4⇓B). We found that the increases in numbers of OT-I cells, especially CD127low OT-I cells, occurred in a dose-dependent manner (data not shown). As shown in Fig. 4⇓C, strong induction of Bcl-2 was found in OT-I cells from rIL-15-treated IL-15 KO hosts during the contraction phase but not during the expansion phase, compared with that in OT-I cells from PBS-treated IL-15 KO hosts on day 11 after infection. These results suggest that the presence of IL-15 during the contraction phase is essential for the survival of IL-7Rαlow effector CD8+ T cells after Listeria infection. Exogenous IL-15 during the contraction phase increased the number of Ag-specific CD8+ T cells in IL-15 KO mice after rLM-OVA infection. IL-15 KO mice that received naive OT-I cells were infected with rLM-OVA and were then treated with rIL-15 or PBS during the initial expansion phase (1–4 days) or contraction phase (7–10 days) of primary immune response. A, Proportion of the OT-I cells in the spleen after rIL-15 treatment was determined on day 11 after infection. The numbers represent the number of OT-I cells as a percentage of CD8+ T cells and as a percentage of total lymphocytes (parentheses). B, Dot plots of Ly5.1+CD8+ cells stained for CD62L and CD127 on day 11 after infection are shown. C, Intracellular expression of Bcl-2 in OT-I cells after rIL-15 treatment. Histograms are gated on Ly5.1+CD8+, Ly5.1+CD8+CD127−, or Ly5.1+CD8+CD127+ cells in spleens from infected mice. The values in the right corner of each panel represent the mean fluorescence intensity of Bcl-2 expression in OT-I cells. D, IL-15 KO mice that received naive OT-I cells were infected with rLM-OVA and then treated with rIL-15 or PBS during the contraction phase (7–10 days) of primary immune responses. Total number of memory OT-I cells in the spleen on day 60 after infection was calculated. ∗∗, p < 0.01. E, Proportions of OT-I cells on day 60 after infection are shown. The numbers represent the number of OT-I cells as a percentage of CD8+ T cells and as a percentage of total lymphocytes (parentheses). F, Dot plots of Ly5.1+CD8+ cells stained for CD62L and CD127 on day 60 after infection are shown. To examine the generation of memory CD8+ T cells in rIL-15-treated IL-15 KO mice at the memory phase, we determined the numbers of transferred OT-I cells in spleens from these mice on day 60 after rLM-OVA infection. As shown in Fig. 4⇑, D and E, rIL-15 treatment during the contraction phase resulted in increased percentages and absolute numbers of memory OT-I cells in IL-15 KO mice on day 60 after rLM-OVA infection. Memory OT-I cells generated in rIL-15-treated IL-15 KO mice showed expression levels of CD127 and CD62L similar to those in memory OT-I cells generated in PBS-treated IL-15 KO mice (Fig. 4⇑F). Therefore, rIL-15 treatment during the contraction phase resulted in increased survival of not only IL-7Rαlow effector cells but also IL-7Rαhigh memory cells after Listeria infection. To determine whether up-regulation of Bcl-2 by IL-15 is involved in the prevention of activated T cell death in vivo, we performed transfer experiments using a mixed donor cell population containing equal numbers of normal OT-I cells (Ly5.1+Ly5.2−) and Bcl-2 Tg OT-I cells (Ly5.1+Ly5.2+) (Fig. 5⇓A). The mixture was transferred into IL-15 KO hosts (Ly5.1−Ly5.2+), and then the hosts were infected with rLM-OVA 24 h later. We examined the ratio of normal OT-I cells to Bcl-2 Tg OT-I cells on days 6 and 10 after infection. As shown in Fig. 5⇓B, substantial expansion of normal OT-I cells and Bcl-2 Tg OT-I cells had occurred in the spleens from IL-15 KO hosts on day 6 after infection. We confirmed by using an adoptive transfer system of CFSE-labeled OT-I cells that enforced expression of Bcl-2 did not affect expansion of OT-I cells during the expansion phase of immune response (data not shown). In contrast, the ratio of normal OT-I cells to Bcl-2 Tg OT-I cells was 15:85 in the spleens from IL-15 KO hosts on day 10 after infection. As shown in Fig. 5⇓C, in IL-15 KO hosts, substantial numbers of IL-7Rαlow Bcl-2 Tg OT-I cells survived in the spleen, whereas IL-7Rαlow normal OT-I cells had disappeared on day 10 after infection. The numbers of IL-7Rαhigh OT-I cells were also higher in Bcl-2 Tg OT-I cells, compared with those in normal OT-I cells in IL-15 KO hosts. There results suggest that up-regulation of Bcl-2 in activated T cells by IL-15 is essential for the survival of IL-7Rαlow effector and IL-7Rαhigh memory CD8+ T cells during the contraction phase after Listeria infection. Enforced expression of Bcl-2 in OT-I cells prevented activated T cell death in IL-15 KO mice after rLM-OVA infection. A, Bcl-2 Tg OT-I cells (Ly5.1+Ly5.2+) and normal OT-I cells (Ly5.1+Ly5.2−) were mixed in equal proportions. The proportion of each donor cell population was determined before adoptive transfer. B, Mixtures of Bcl-2 Tg OT-I cells and normal OT-I cells were adoptively transferred into IL-15 KO mice (Ly5.1−Ly5.2+) that were then infected with rLM-OVA 24 h later. The graph depicts the ratio of normal OT-I cells to Bcl-2 Tg OT-I cells at indicated days before and after infection. Each value is the mean of three mice + SD. ∗∗∗, p < 0.005. C, CD127 expression on either normal OT-I cells or Bcl-2 Tg OT-I cells transferred into IL-15 KO mice was examined on days 6 and 10 after infection. The numbers in the lower corners of each plot refer to the percentage of CD127-negative effector OT-I cells (Ly5.1+CD8+) that are derived from Ly5.2+ (Bcl-2 Tg OT-I cells) or Ly5.2− (normal OT-I cells). Recent studies have demonstrated that IL-15Rα-mediated transpresentation of IL-15 is a major mechanism of IL-15-mediated actions (22, 31, 32, 33). To determine whether expression of IL-15Rα by effector OT-I cells or by host cells is required for the survival of effector OT-I cells, we adoptively transferred IL-15Rα+/+ OT-I cells or IL-15Rα−/− OT-I cells into IL-15Rα+/+ or IL-15Rα−/− hosts followed by challenge with rLM-OVA. As shown in Fig. 6⇓A, nearly identical numbers of IL-15Rα+/+ OT-I cells and IL-15Rα−/− OT-I cells were obtained from spleens of IL-15Rα+/+ hosts on days 7 and 10 after primary infection. In contrast, the numbers of IL-15Rα+/+ OT-I cells in IL-15Rα−/− hosts on day 7 after infection were almost same as those in IL-15Rα+/+ hosts, whereas the number of IL-15Rα+/+ OT-I cells in IL-15Rα−/− hosts was significantly lower on day 10 after infection. The numbers of IL-7RαlowIL-15Rα+/+ and IL-7RαlowIL-15Rα−/− OT-I cells in IL-15Rα+/+ hosts on day 10 after Listeria infection were comparable, whereas IL-7RαlowIL-15Rα+/+ OT-I cells transferred into IL-15Rα−/− hosts had disappeared on day 10 after infection (Fig. 6⇓B). As shown in Fig. 6⇓C, intracellular expression levels of Bcl-2 in IL-7Rαlow OT-I cells among IL-15Rα+/+ and IL-15Rα−/− cells had increased equally during the contraction phase after infection in IL-15Rα+/+ hosts. In contrast, IL-7RαlowIL-15Rα+/+ OT-I cells could not up-regulate expression of Bcl-2 by day 10 after Listeria infection in IL-15Rα−/− hosts. These results suggest that IL-15Rα expression on host cells but not on OT-I cells is crucial for the survival of effector OT-I cells during the contraction phase after Listeria infection. IL-15Rα expression on host cells but not on CD8+ T cells was required for the survival of effector CD8+ T cells during the contraction phase after rLM-OVA infection. IL-15Rα+/+ or IL-15Rα−/− OT-I cells (Ly5.1+) were adoptively transferred into IL-15Rα+/+ or IL-15Rα−/− hosts that were then infected with rLM-OVA 24 h later. A, Proportions of OT-I cells in the spleen from OT-I chimeric mice on days 7 and 10 after infection. The results of flow cytometry are presented as typical profiles after an analysis gate had been set on CD8+ cells. The numbers represent the number of OT-I cells as a percentage of CD8+ T cells and as a percentage of total lymphocytes (parentheses). B, Dot plots of Ly5.1+CD8+ cells stained for CD62L and CD127 on days 7 and 10 after infection are shown. C, Changes in mean fluorescence intensity (MFI) of Bcl-2 staining in CD127− and CD127+ OT-I cells from IL-15Rα+/+OT-I>+/+, IL-15Rα+/+OT-I >−/−, and IL-15Rα−/−OT-I>+/+ chimeric mice on days 7 and 10 after rLM-OVA infection. ∗, p < 0.05; ∗∗, p < 0.01. To investigate the therapeutic efficacy of rIL-15 in promoting memory T cell generation in normal mice, we administrated rIL-15 to rLM-OVA-infected C57BL/6 mice during the contraction phase (7–10 days). As shown in Fig. 7⇓A, the numbers of OVA257–264-specific CD8+ T cells in both peripheral lymphoid and nonlymphoid tissues were significantly increased in rIL-15-treated normal mice on day 11 after infection. Staining for T cell subpopulations revealed that the CD127low subset in rIL-15-treated normal mice was much larger than other subsets on day 11 after rLM-OVA infection (Fig. 7⇓B); absolute numbers of CD127high subsets were also increased in rIL-15-treated normal mice. Similarly, treatment of BALB/c mice with rIL-15 during the contraction phase resulted in an increase in the number of listeriolysin O91–99-specific CD8+ T cells on day 14 after L. monocytogenes infection (data not shown). Thus, in vivo administration of rIL-15 during the contraction phase enhanced survival of Ag-specific CD8+ T cells in two different mouse strains. rIL-15 treatment during the contraction phase resulted in an increased number of Ag-specific memory CD8+ T cells and provided robust protective immunity against secondary Listeria infection. A, rLM-OVA-infected C57BL/6 mice were injected with 0.5 μg of rIL-15 or PBS during the contraction phase (7–10 days). Proportions of the OVA257–264-specific CD8+ T cells in the spleen, PEC, peripheral LN, and PBMC were examined after rIL-15 treatment. The numbers represent the number of MHC tetramer binding cells as a percentage of CD8+ T cells and as a percentage of total lymphocytes (parentheses). B, Dot plots of CD8+ and OVA257–264 Kb tetramer staining-positive cells stained for CD62L and CD127 11 days after infection are shown. C, On day 60 after initial infection, rIL-15-treated or PBS-treated mice were challenged with a lethal dose of rLM-OVA. Naive C57BL/6 mice were introduced into the experiment at that time point. Bacterial numbers in the PEC, spleen, and liver on day 3 after the secondary challenge were determined. Data were obtained from three separate experiments, and each value shown is the mean + SD for five mice. ∗, p < 0.05; ∗∗, p < 0.01; ∗∗∗, p < 0.005. D, Proportions of OVA257–264-specific CD8+ T cells in the PEC and spleen from representative mice on day 5 after primary or secondary infection. Analysis gate had been set on CD8+ cells. To determine the protective capacity of memory CD8+ T cells generated in rIL-15-treated normal mice, we administrated rIL-15 or PBS to rLM-OVA-immune C57BL/6 mice during the contraction phase (7–10 days). On day 60 after initial infection, we rechallenged these previously infected mice and naive mice with a lethal dose of rLM-OVA and determined the number of bacteria in the PEC, spleen, and liver on day 3 after rechallenge. We also compared expansion of OVA257–264-specific memory CD8+ T cells in these mice on day 5 after rechallenge. As expected, memory CD8+ T cells in PBS-treated mice provided substantial protective immunity against rechallenge with rLM-OVA (Fig. 7⇑C). Administration of rIL-15 during the contraction phase resulted in 10-fold reductions in bacterial loads in the PEC, spleen, and liver of immunized mice, compared with those in the case of PBS administration on day 3 after reinfection. The proportions of OVA257–264-specific CD8+ T cells in the PEC and spleen were substantially increased in rIL-15-treated immune mice, compared with those in PBS-treated immune mice on day 5 after reinfection (Fig. 7⇑D). These results suggest that rIL-15 treatment during the contraction phase provides robust protective immunity against reinfection. In this study, we examined the roles of IL-15 in activated T cell death using a system of adoptive transfer of OT-I cells into naive IL-15 KO or IL-15 Tg hosts that were subsequently infected with rLM-OVA. We found that the survival of effector CD8+ T cells during the contraction phase is critically dependent on transpresentation of IL-15 by IL-15Rα. Enforced expression of Bcl-2 in Ag-specific CD8+ T cells protected the majority of activated T cells from death in an IL-15-deficient environment. 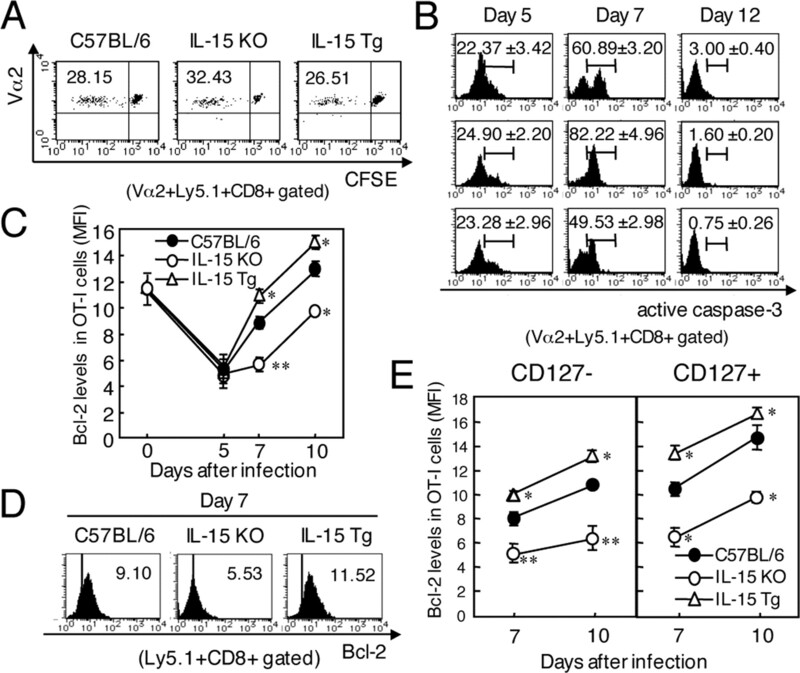 These results suggest that IL-15 plays an important role in the survival of effector CD8+ T cells after Listeria infection via up-regulation of Bcl-2 expression. There are several possible explanations of how IL-15 serves to increase numbers of effector CD8+ T cells during the contraction phase of immune response. The first possibility is that different kinetics of bacterial burden may affect the number of effector CD8+ T cells during the course of infection. However, we found that the kinetics of bacterial growth was similar in all groups, and no difference in the number of bacteria was detected in the spleen between control and IL-15KO mice during the course of infection. IL-15 is important in maturation of dendritic cells for Ag presentation (34), raising the second possibility that generation of effector cells or memory cell precursors may be affected during the expansion phase. Schluns et al. (24) suggested that IL-15 was required for the generation of Ag-specific CD8+ T cells after VSV infection, whereas we found in the present study that the numbers of both IL-7Rαlow and IL-7Rαhigh OT-I cells in IL-15 KO or IL-15 Tg mice were comparable to those in control mice at the peak of immune response to rLM-OVA. Therefore, IL-15 may not be required for generation of effector OT-I cells during the expansion phase of rLM-OVA infection. Becker et al. (21) have reported that the CD8+ T cell responses to most of epitopes, including NP396, were only slightly, if any, affected after primary infection, whereas CD8+ T cell response to one epitope (GP33) did show a rather dramatic requirement for IL-15. Wang et al. (35) showed that CD8+ T cells specific to LCMV epitopes NP396 and GP33 differed in their preapoptotic state, with NP396-specific T cells binding more annexin V than GP33-specifc T cells during the expansion phase on day 8 after LCMV infection. These results suggest that population of T cells specific to different epitopes can have different properties such as IL-15 dependency during the expansion phase after acute infection. The difference in IL-15 dependency may be linked to intrinsic properties of the epitopes such as avidity of epitope and T cells. The discrepancy between VSV and rLM-OVA infections may be at least partly explained by a difference in intrinsic properties of the epitopes. Several studies have shown that IL-15 has the potential roles in maintenance of Ag-specific memory CD8+ T cells, which are capable of slowly dividing without Ag stimulation, during the memory phase (21, 22, 23, 24). Therefore, another possibility is that IL-15 may induce proliferation of effector/memory CD8+ T cells during the contraction phase. However, we found that endogenous IL-15 did not affect proliferation of OT-I cells during the contraction phase after Listeria infection, thus excluding this possibility. IL-15 has been shown to be a potent inhibitor of several apoptosis pathways in several lymphocytes via induction of antiapoptotic molecules (36, 37, 38, 39, 40). Hence, it is also possible that IL-15 protects activated T cells from apoptosis during the contraction phase. We favor this possibility because we found that intracellular expression level of active caspase-3 in OT-I cells was increased significantly in IL-15 KO mice but decreased in IL-15 Tg mice during the contraction phase, compared with control mice. In the present study, we examined the protective role of IL-15 in contraction of CD8+ T cells specific to only one immunodominant epitope. The generality of this finding and its possible implications awaits further analysis with different epitopes. The generality of this finding and its possible implications awaits further analysis with different epitopes. It has been shown that up-regulation of Bcl-2 expression in activated T cells plays a central role in prevention of activated T cell death in vivo (4, 5). We found that IL-7Rαlow effector OT-I cells in IL-15 KO mice failed to up-regulate Bcl-2 expression during the contraction phase and resulted in disappearance of their subsets and that their death can be inhibited by Bcl-2 overexpression. Moreover, in vivo administration of rIL-15 during the contraction phase in IL-15 KO mice restored expression of Bcl-2 in OT-I cells and inhibited the abolishment of effector OT-I cells. Therefore, it is most likely that IL-15 serves to protect effector CD8+ T cells from apoptosis by inducing up-regulation of Bcl-2 expression. Bcl-2 expression is induced via signaling from cγ-chain (15, 16), which is used by IL-2, IL-4, IL-7, IL-9, and IL-21, as well as IL-15. It has been shown that rIL-2 treatment during the contraction phase increased the expression of Bcl-2 in effector CD8+ T cells after LCMV infection, resulting in increased survival of Ag-specific CD8+ T cells (41). We found that the expression of Bcl-2 in effector OT-I cells could be induced not only upon stimulation with rIL-15 but also upon stimulation with rIL-2 in vitro in a dose-dependent manner (our unpublished data). Therefore, IL-2 may also increase the survival of effector CD8+ T cells during the contraction phase via inducing Bcl-2 expression. Activated T cells capable of producing IL-2 disappear rapidly during the contraction phase of primary immune response, whereas IL-15 may be constitutively produced by non-T cells during the contraction phase. This may explain why effector CD8+ T cells use only IL-15 rather than the other common γ cytokines, including IL-2, during the contraction phase under physiological conditions. There has been an accumulation of evidence supporting the idea that transpresentation of IL-15 is a major mechanism of IL-15-mediated actions (22, 31, 32, 33). We also found that transpresentation of IL-15 by IL-15Rα plays a major role in up-regulation of Bcl-2 expression in effector CD8+ T cells during the contraction phase. We speculate that IL-15Rα+ host cells, after binding IL-15, may retain the complex and act as a reservoir for IL-15 after reduction of survival cytokines production during the contraction phase. Although a previous study suggested that IL-2Rα could present IL-2 in trans (42), IL-2Rα alone binds IL-2 with low affinity, and in vivo studies with IL-2Rα KO T cells indicated that IL-2Rα plays a cell-autonomous role in supporting T cells (43, 44). Taken together, transpresentation of IL-15 but not IL-2 by host cells were critical for the survival of effector CD8+ T cells during the contraction phase of immune response via up-regulation of Bcl-2 expression. A notable finding in the present study is that IL-15 could increase the survival of not only IL-7Rαlow effector cells but also IL-7Rαhigh memory cells during the contraction phase. A recent study has shown that only those IL-7Rα-expressing Ag-specific CD8+ T cells at the peak of primary immune response give rise to memory cells after adoptive transfer into naive hosts (29, 30), suggesting that only IL-7Rαhigh cells are capable of surviving CD8+ T cell contraction. It has been shown that expression of Bcl-2 was partially impaired in IL-7Rα-deficient OT-I cells during the contraction phase after VSV-OVA infection, resulting in a decrease in the number of memory CD8+ T cells (45). These findings suggest that IL-7 is required for the survival of IL-7Rαhigh memory CD8+ T cells during the contraction phase. In the present study, we found that IL-15 is also involved in the protection IL-7RαhighCD8+ T cells from apoptosis during the contraction phase via inducing Bcl-2 expression. Collectively, these findings suggest that both IL-15 and IL-7 participate in the increased survival of memory CD8+ T cells during the contraction phase via inducing Bcl-2 expression. Administration of rIL-15 during the contraction phase may be useful for enhancing vaccination. However, IL-15 may have prolonged effector responses rather than increasing memory cells because IL-15 therapy during the contraction phase resulted in a greater increase in the number of IL-7Rαlow effector cells than the number of IL-7Rαhigh memory subsets and resulted in a gradual decreases in the number of Ag-specific CD8+ T cells over a period of several months. Therefore, IL-15 may be more useful in strategies for treating chronic infections, including Mycobacterium tuberculosis infection, in which transient prolongation of T cell responses may be required to reduce the bacterial burden. Additional experiments on M. tuberculosis infection may enable us to determine conclusively whether IL-15 is useful for the development of new immunoprotective approaches against chronic infection. We thank Yohko Kobayashi and Kazue Kaneda for their excellent technical assistance. ↵1 This work was supported by research grants from a Grant-in-Aid for Scientific Research on Priority Areas and Young Scientists (B), Japan Society for Promotion of Science, and grants from the Japanese Ministry of Education, Science and Culture (to Y.Y. ), the Yakult Bioscience Foundation (to Y.Y. ), and the Uehara Memorial Foundation (to Y.Y.). ↵3 Abbreviations used in this paper: ACAD, activated T cell autonomous cell death; cγ, common cytokine receptor γ; LCMV, lymphocytic choriomeningitis; VSV, vesicular stomatitis virus; KO, knockout; Tg, transgenic; rLM-OVA, recombinant Listeria monocytogenes expressing OVA; PEC, peritoneal exudate cell; LN, lymph node. Wong, P., E. G. Pamer. 2003. CD8 T cell responses to infectious pathogens. Ann. Rev. Immunol. 21: 29-70. Ahmed, R., D. Gray. 1996. Immunological memory and protective immunity: understanding their relation. Science 272: 54-60. Schluns, K. S., L. Lefrancois. 2003. Cytokine control of memory T cell development and survival. Nat. Rev. Immunol. 3: 269-279. Hildeman, D. A., Y. Zhu, T. C. Mitchell, J. Kappler, P. Marrack. 2002. Molecular mechanisms of activated T cell death in vivo. Curr. Opin. Immunol. 14: 354-349. Marsden, V. S., A. Strasser. 2003. Control of apoptosis in the immune system: Bcl-2, BH3-only proteins and more. Annu. Rev. Immunol. 21: 71-105. Ju, S., D. J. Panka, H. Cui, R. Ettinger, M. El-Khatib, D. H. Sherr, B. Z. Stanger, A. Marshak-Rothenstein. 1995. Fas(CD95)/Fas-ligand interactions required for programmed cell death after T cell activation. Nature 373: 444-448. Sytwu, H. K., R. S. Liblau, H. O. McDevitt. 1996. The roles of Fas/APO-1 (CD95) and TNF in antigen-induced programmed cell death in T cell receptor transgenic mice. Immunity 5: 17-30. Nagata, S., T. Suda. 1995. Fas and Fas ligand: lpr and gld mutations. Immunol. Today 16: 39-43. Hildeman, D. A., Y. Zhu, T. C. Mitchell, P. Bouillet, A. Strasser, J. Kappler, P. Marrack. 2002. Activated T cell death in vivo mediated by proapoptotic bcl-2 family member bim. Immunity 16: 759-767. Pellegrini, M., G. Belz, P. Bouillet, A. Strasser. 2003. Shutdown of an acute T cell immune response to viral infection is mediated by the proapoptotic Bcl-2 homology 3-only protein Bim. Proc. Natl. Acad. Sci. USA 100: 14175-14180. Lohman, B. L., E. S. Razvi, R. M. Welsh. 1996. T lymphocyte down-regulation after acute viral infection is not dependent on CD95 (Fas) receptor-ligand interactions. J. Virol. 70: 8199-8203. Nguyen, L. T., K. McKall-Faienza, A. Zakarian, D. E. Speiser, T. W. Mak, P. S. Ohashi. 2000. TNF receptor 1 (TNFR1) and CD95 are not required for T cell deletion after virus infection but contribute to peptide-induced deletion under limited conditions. Eur. J. Immunol. 30: 683-688. Van Parijs, L., D. A. Peterson, A. K. Abbas. 1998. The Fas/Fas ligand pathway and Bcl-2 regulate T cell responses to model self and foreign antigens. Immunity 8: 265-274. Nakajima, H., E. W. Shores, M. Noguchi, W. J. Leonard. 1997. The common cytokine receptor γ chain plays an essential role in regulating lymphoid homeostasis. J. Exp. Med. 185: 189-195. Gett, A. V., F. Sallusto, A. Lanzavecchia, J. Geginat. 2003. T cell fitness determined by signal strength. Nat. Immunol. 4: 355-360. Grabstein, K. H., J. Eisenman, K. Shanebeck, C. Rauch, S. Srinivasan, V. Fung, C. Beers, J. Richardson, M. A. Schoenborn, M. Ahdieh, et al 1994. Cloning of a T cell growth factor that interacts with the β chain of the interleukin-2 receptor. Science 264: 965-968. Waldmann, T. A., Y. Tagaya, R. N. Bamford. 1998. Interleukin-2, interleukin-15, and their receptors. Int. Rev. Immunol. 16: 205-226. Bamford, R. N., A. J. Grant, J. D. Burton, C. Peters, G. Kurys, C. K. Goldman, J. Brennan, E. Roessler, T. A. Waldmann. 1994. The interleukin (IL) 2 receptor β chain is shared by IL-2 and a cytokine, provisionally designated IL-T, that stimulates T cell proliferation and the induction of lymphokine-activated killer cells. Proc. Natl. Acad. Sci. USA 91: 4940-4944. Becker, T. C., E. J. Wherry, D. Boone, K. Murali-Krishna, R. Antia, A. Ma, R. Ahmed. 2002. Interleukin 15 is required for proliferative renewal of virus-specific memory CD8 T cells. J. Exp. Med. 195: 1541-1548. Burkett, P. R., R. Koda, M. Chien, S. Chai, F. Chan, A. Ma, D. L. Boone. 2003. IL-15 Rα expression on CD8+ T cells were indispensable for T cell memory. Proc. Natl. Acad. Sci. USA 100: 4724-4729. Yajima, T., H. Nishimura, R. Ishimitsu, T. Watase, D. H. Busch, E. G. Pamer, H. Kuwano, Y. Yoshikai. 2002. Overexpression of IL-15 in vivo Increases antigen-driven memory CD8+ T cells following a microbe exposure. J. Immunol. 168: 1198-1203. Schluns, K. S., K. Williams, A Ma, X. X. Zheng, L. Lefrancois. 2002. Cutting edge: requirement for IL-15 in the generation of primary and memory antigen-specific CD8 T cells. J. Immunol. 168: 4827-4831. Nishimura, H., T. Yajima, Y. Naiki, H. Tsunobuchi, M. Umemura, K. Itano, T. Matsuguchi, M. Suzuki, P. S. Ohashi, Y. Yoshikai. 2000. Differential roles of interleukin 15 mRNA isoforms generated by alternative splicing in immune responses in vivo. J. Exp. Med. 191: 157-170. Strasser, A., A. W. Harris, S. Cory. 1991. bcl-2 transgene inhibits T cell death and perturbs thymic self-censorship. Cell 67: 889-899. Dudani, R., Y. Chapdelaine, H. van Faassen, D. K. Smith, H. Shen, L. Krishnan, S. Sad. 2002. Multiple mechanisms compensate to enhance tumor-protective CD8+ T cell response in the long-term despite poor CD8+ T cell priming initially: comparison between an acute versus a chronic intracellular bacterium expressing a model antigen. J. Immunol. 168: 5737-5745. Yajima, T., H. Nishimura, S. Sad, H. Shen, H. Kuwano, Y. Yoshikai. 2004. A novel role of IL-15 in early activation of memory CD8+ CTL after re-infection. J. Immunol. 174: 3590-3597. Huster, K. M., V. Busch, M. Schiemann, K. Linkemann, K. M. Kerksiek, H. Wagner, D. H. Busch. 2004. Selective expression of IL-7 receptor on memory T cells identifies early CD40L-dependent generation of distinct CD8+ memory T cell subsets. Proc. Natl. Acad. Sci. USA 101: 5610-5615. Dubois, S., J. Mariner, T. A. Waldmann, Y. Tagaya. 2002. IL-15Rα recycles and presents IL-15 in trans to neighboring cells. Immunity 17: 537-547. Schluns, K. S., K. D. Klonowski, L. Lefrancois. 2004. Transregulation of memory CD8 T-cell proliferation by IL-15Rα+ bone marrow-derived cells. Blood 103: 988-994. Burkett, P. R., R. Koka, M. Chien, S. Chai, D. L. Boone, A. Ma. 2004. Coordinate expression and trans presentation of interleukin (IL)-15Rα and IL-15 supports natural killer cell and memory CD8+ T cell homeostasis. J. Exp. Med. 200: 825-834. Ohteki, T., K. Suzue, C. Maki, T. Ota, S. Koyasu. 2001. Critical role of IL-15-IL-15R for antigen-presenting cell functions in the innate immune response. Nat. Immunol. 2: 1138-1143. Wang, X. Z., M. A. Brehm, R. M. Welsh. 2004. Preapoptotic phenotype of viral epitope-specific CD8 T cells precludes memory development and is an intrinsic property of the epitope. J. Immunol. 173: 5138-5147. Naora, H., M. L. Gougeon. 1999. Interleukin-15 is a potent survival factor in the prevention of spontaneous but not CD95-induced apoptosis in CD4 and CD8 T lymphocytes of HIV-infected individuals: correlation with its ability to increase BCL-2 expression. Cell Death Differ. 6: 1002-1011. Bulfone-Paus, S., D. Ungureanu, T. Pohl, G. Lindner, R. Paus, R. Ruckert, H. Krause, U. Kunzendorf. 1997. Interleukin-15 protects from lethal apoptosis in vivo. Nat. Med. 3: 1124-1128.
Cooper, M. A., J. E. Bush, T. A. Fehniger, J. B. VanDeusen, R. E. Waite, Y. Liu, H. L. Aguila, M. A. Caligiuri. 2002. In vivo evidence for a dependence on interleukin 15 for survival of natural killer cells. Blood 100: 3633-3638. Berard, M., K. Brandt, S. Bulfone-Paus, D. F. Tough. 2003. IL-15 promotes the survival of naive and memory phenotype CD8+ T cells. J. Immunol. 170: 5018-5026. Wu, T. S., J. M. Lee, Y. G. Lai, J. C. Hsu, C. Y. Tsai, Y. H. Lee, N. S. Liao. 2002. 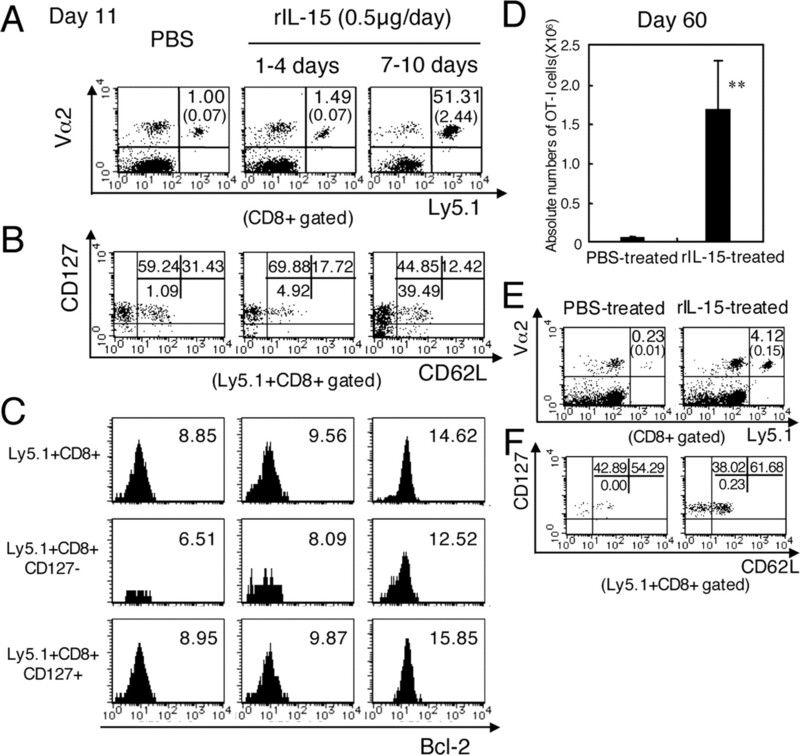 Reduced expression of Bcl-2 in CD8+ T cells deficient in the IL-15 receptor α-chain. J. Immunol. 168: 705-712. Blattman, J. N., J. M. Grayson, E. J. Wherry, S. M. Kaech, K. A. Smith, R. Ahmed. 2003. Therapeutic use of IL-2 to enhance antiviral T cell responses in vivo. Nat. Med. 9: 540-547. Eicher, D. M., T. A. Waldmann. 1998. IL-2Rα on one cell can present IL-2 to IL-2Rβ/γ(c) on another cell to augment IL-2 signaling. J. Immunol. 161: 5430-5437. Willerford, D. M., J. Chen, J. A. Ferry, L. Davidson, A. Ma, F. W. Alt. 1995. Interleukin-2 receptor α chain regulates the size and content of the peripheral lymphoid compartment. Immunity 3: 521-530. D’Souza, W. N., K. S. Schluns, D. Masopust, L. Lefrancois. 2002. Essential role for IL-2 in the regulation of antiviral extralymphoid CD8 T cell responses. J. Immunol. 168: 5566-5572.